Looking for a career but need more education in a particular field? The City of Myrtle Beach is partnering with Horry Georgetown Technical College to develop “Train to Work MB.” The program focuses on six career tracks: hospitality, culinary, electrician assistant, plumbing assistant, certified nurse’s aide, retail. The city is providing $20,000 to cover in-city students who lack the financial resources get career training. To qualify for the free city assistance, you must be a City of Myrtle Beach resident. “Train to Work MB” classes will be held in various locations. Transportation, books and tools will be provided as part of the city’s contribution. 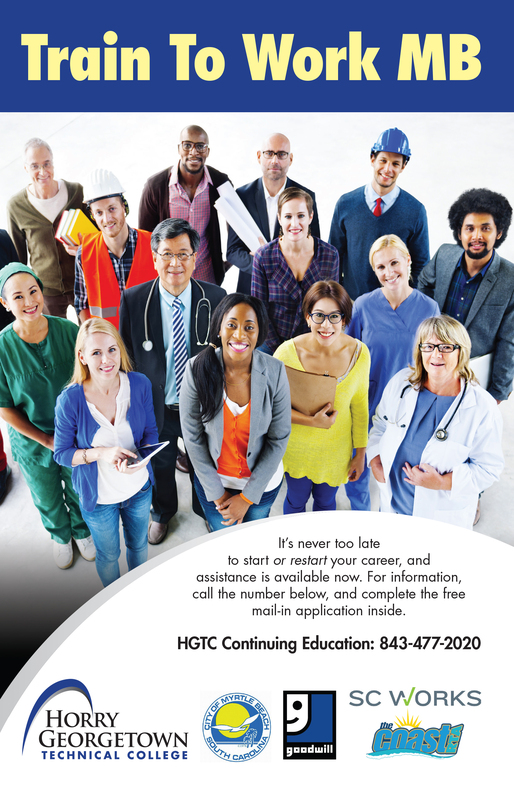 For more information or to fill out a free application, call Horry-Georgetown Technical College Continuing Education at 843-477-2020 or City of Myrtle Beach Neighborhood Services 843-918-1062. Click here to download the Train To Work MB course descriptions and application. Goodwill, SC Works and Coast RTA are also sponsors of this program.